We are excited to have Ashley Renee’ Bridal as our guest blogger today! Read below about their top tips about finding the perfect wedding gown. 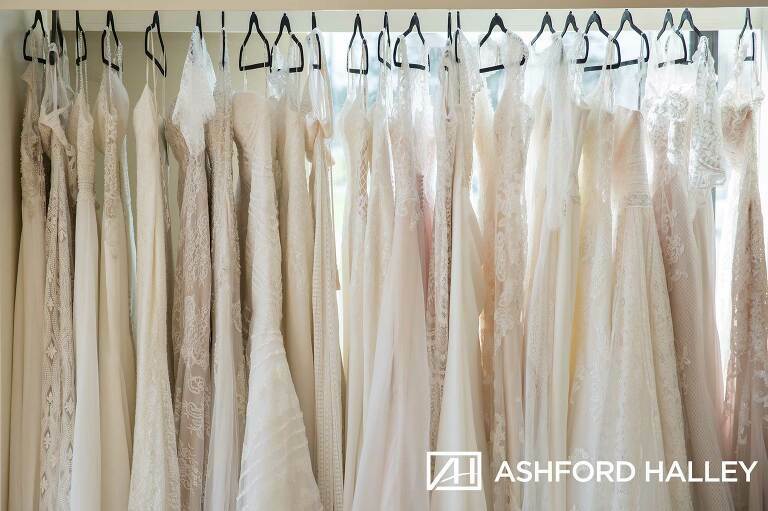 Ashford Halley was just there last week photographing their store, and we did a short promo video featuring their top selling wedding dress vendor, Stella York! Whether you’re a bride who has dreamed of her wedding dress since she was a little girl or you’re considering your dress for the first time, finding ‘the one’ should be an experience that you can look back on with gladness. For that reason, there are a few things to keep in mind when shopping for your wedding gown to help make the process as care free and successful as possible. It is common for a wedding dress to take weeks and sometimes months to arrive after you’ve ordered it. So, it’s never too early after your engagement to begin looking for your dress. Be mindful of this and allow time for alterations should they be necessary. During your appointment, let your consultant know any basic information you may have about the event — the season, the color scheme, the venue, the time of day or night…Gather your thoughts on favorite silhouettes, designs you shy away from, likes and dislikes, fabric preferences. If you have inspiration images, bring them. In addition, ask yourself why you like those images. Define what it is you like about a particular image as this will reveal some things about your style sensibilities that can be helpful in finding your perfect dress. In the same breath, keep an open mind. Your bridal consultant will usually have years of experience coupled with an expertise in bridal fashion. If your consultant pulls a wild card dress at your appointment, humor her and try it on. It’s worth the few moments it will take to stand in front of the mirror – you might just be pleasantly surprised. A dress that you might normally overlook on the rack can take on a whole new life when you put it on. In these appointments your consultant gets to know you, and they already know every dress hanging in the shop. Every now and then, a professional will get a hunch about a gown and will ask you to try one on that you might not have chosen yourself. It’s not a guarantee, but consultants see it all the time. After all, they’re not just helping you find a dress, they’re helping you find THE dress. Consider who you want to take with you to your appointment. 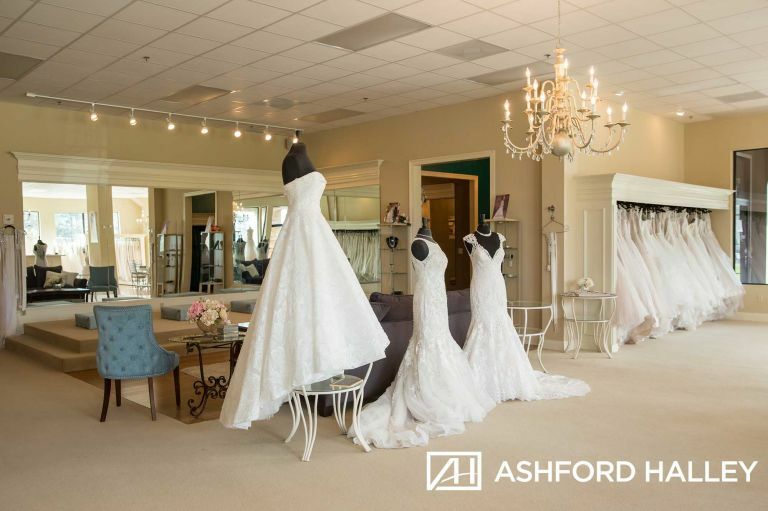 In speaking with the consultants at Ashley Renee’ Bridal, who you bring and how many people you bring can sometimes mean the difference between a special day or a stressful day. You want to bring a small number of people who know you well and understand your vision. Bringing a smaller group of people usually makes for a more intimate and often more successful shopping experience. Later, after you’ve made your decision, you always have the option to make another appointment to try on your dress for a larger group of family and friends if you’d like to do so. You can expect your consultant to ask about your budget. 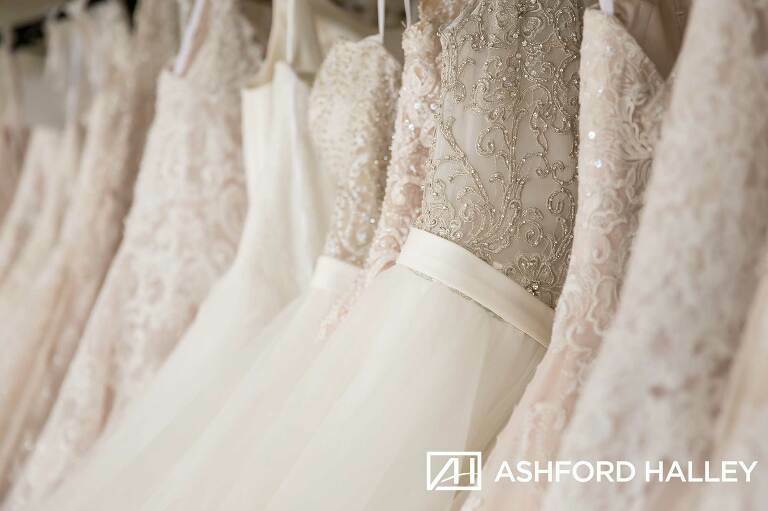 Ashley Renee’ Bridal carries a vast selection of bridal gowns and accessories across multiple price ranges. Speak freely with your consultant about your budgetary needs and limits. Consultants are deeply knowledgable about every item they carry. They stay conscious of that conversation while pulling options for you to try. Your consultant wants to work with you to put your look together, not against you. The aim is to make your vision come to life. Your consultant knows that your vision includes more than just the dress. Consider veils, sashes, shoes, jewelry, hair accessories, and other details to complete your bridal look. And know too, that although sometimes the first dress you put on is the one, often times, your appointment is a process. A consultant has you try a dress, discovers what you love about it and what you don’t and then uses that information to determine which dress to try on next. At Ashley Renee’ Bridal, they are committed to you and your search, and consider it a pleasure to be a part of such a sweet time in your life. Last, and most important, in the midst of all of the planning and details, all of the organizing and coordinating, all of the festivities, all of the excitement and stress, don’t lose sight of what it is you are actually preparing to celebrate. You are finding the dress you are going to wear to celebrate your marriage to the one you love. You are marrying the one who loves you. You are devoting your lifetime to the love, affection, and friendship of another. You are celebrating your family and all of the new things your future will hold. This is why the consultants at Ashley Renee’ Bridal are passionate about what they do. It is a privilege to help you prepare for such a beautiful adventure. 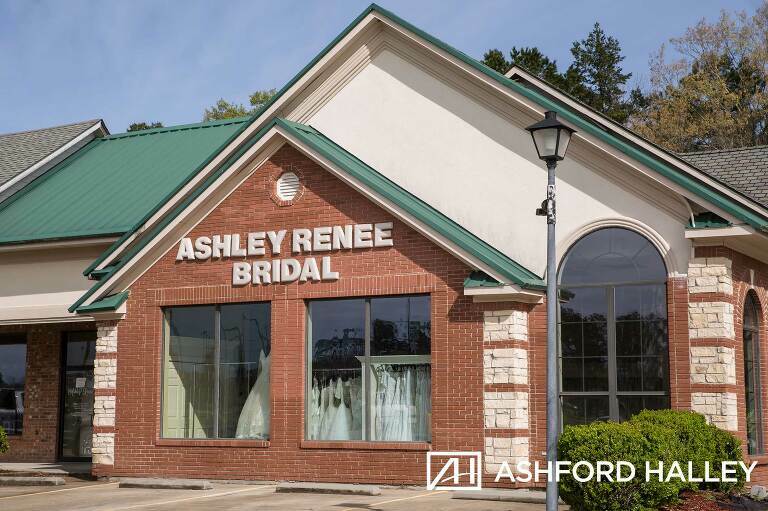 Check out the images from Ashley Renee’ Bridal’s store front below! And, make sure to follow their Facebook & Instagram for the latest Bridal Fashion updates!! Make sure to follow Ashford Halley’s Facebook & Instagram! For more information on our services, visit www.ashfordhalley.com!